Many tutorials and posts discuss creating green-field grails application. In this post, I am going to cover creating a simple grails CRUD application using an existing legacy database schema using GORM DSL. This article assumes that you understand Oracle database, grails and GORM basics. Follow on posts may discuss topics such as testing the GORM DSL mappings, adding access control and creating simple reports. NOTE: I got a lot of the information for this post from the "Advanced GORM kung fu" chapter of the Grails in Action book from Manning. I highly recommend this book. In creating this post, I am using the netbeans 6.7 RC3 IDE, Sun JDK 1.6.0_14, groovy 1.6.3, grails 1.1.1 and Oracle XE on an Ubuntu workstation. However, the code I am showing should work just fine on any OS/IDE/Oracle combination. I have chosen the Oracle XE database because it comes with several example database schemas in a freely available database and Oracle is a database that I often work with professionally. After you have installed the Oracle XE database: 1) enable the hr user and 2) change it's password. Verify that you can successfully connect to the hr database with you new password via sqlplus, SQL Developer or some other tool. I will start by creating domain classes for just 3 of the tables, the Region, Country and Location tables. These tables are more straight forward and we can cover the other tables in another post. Copy the Oracle JDBC driver ojdbc14.jar to hrReports/lib. The Oracle JDBC Driver can be copied from $ORACLE_HOME/jdbc/lib or downloaded from the Oracle site. Our front end development is complete. 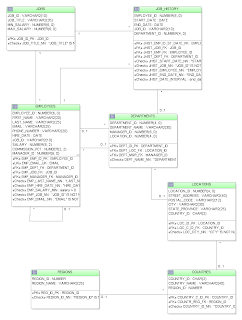 This change allows hibernate to work (it has an id), the code to reference regionID and the mapping from the GORM DSL to Database columns to work as expected. If we are inserting a new record with this approach, we need to user the save(insert:true) since a non-null id indicates a persisten instance. There is a one-to-many relationship that is represented by the region field. If you made it this far, you really do care about GORM legacy DB mappings. It takes longer to write this blog post than to figure out and write the CRUD application using the GORM DSL mappings. It does seem to be possible to quickly map legacy databases with GORM DSL. This was completed in a couple of hours and in 224 LOC (not counting Unit Tests). I think the next times will be much quicker. I can make available the Domain Classes for the rest of the HR schema. Also, I would like to write more thorough Unit Tests to verify that the GORM DSL mappings are doing what we expect. I think normally this shouldn't be necessary and we can expect our ORM tools to do what they are supposed to, but in this case, it will help to reassure myself that the GORM DSL mappings are doing what I expect them to be doing. Good stuff. You can omit the blank:false and unique:true constraints on the PK fields though - or are those required because of the nonstandard PKs? Great post. I need to get "Grails in Action". I am not 100% sure, but I think since the id generator is set to assigned, grails wouldn't do any constraint checking on the id. I will try and verify this for my next post. I don't get it why do we have to define a regionId in the groovy code. Actually the default id field names work perfectly. This post gives sample code how it works. Excellent! Just what I was looking for. My set up was simpler since my id field was actually named id in the db. Thanks for your post; marketing course is most trusted course to validate marketing. This course provides precise and complete information about a online marketing course. I really like and appreciate your blog post, thanks again. Want some more stuff. New exclusive song by Music MG, this is a very good song. i read your post this post gives a very better idea on Loadrunner.